The further backward you look the further forward you see. – Sir Winston Churchill. There is actually very little information around to show traders how to recognize a major market top, but even more important, how to exit before the dramatic fall which inevitably follows. Identifying a major stock market top can, therefore, help traders / investors to avoid large capital losses, or, indeed, short almost any stock on the way down, especially banks. Present a way for traders to have the strength to actually do the opposite to the herd, always so thunderous at momentous market peaks like the one recently seen in 2007 / 8. One of last century’s great traders, W.D. Gann, suggested an exact 18.6 year cycle (18 years and 8 months) is present in the US stock market, which he published as a chart, in 1909. Gann suggested it was his “most important ever discovery”, though he went on to say that about several other things as well. Nevertheless, the discovery involved “time”, the first time Gann ever mentioned the fact, and since cycles are time based, perhaps it is worth a look. Study in particular the years as marked with a ‘k’. 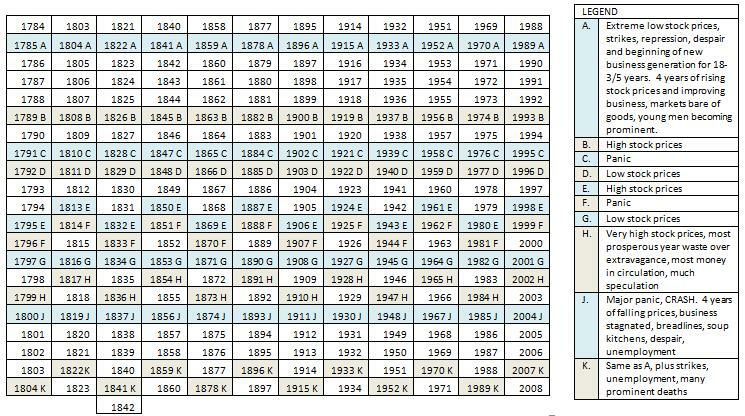 It was my study of US real estate collapses that first drew me to this Gann Financial table many years ago. 1914, 1933, 1952 and 1970: all subsequent major stock market lows. Remember, Gann published that in 1909! A year in which a bear market ends and a bull market begins. 1901, 1911, 1921. The second year is a year of a minor bull market, or a rally in a bear market will start at some time. 1902, 1912, 1922, 1932. Starts a bear year, but the rally from the second year may run to March or April before culmination, or a decline from the 2nd year may run down and make bottom in February or March, like 1933. 1903, 1913, 1923. The fourth year is a bear year, but ends the bear cycle and lays the foundation for a bull market. Compare 1904, 1914. The fifth year is the year of Ascension, and a very strong year for a bull market. See 1905, 1915, 1925, 1935. The sixth year is a bull year, in which a bull campaign which started in the fourth year ends in the Fall of the year and a fast decline starts. See 1896, 1906, 1916, 1926. Seven is a bear number and the seventh year is a bear year because 84 months or 840 degrees is 7/8ths of 90. See 1897, 1907, 1917, but note 1927 was the end of a 60 year cycle, so not much of a decline. Nine is the highest digit and the ninth year is the strongest of all for the bull markets. Final bull campaigns culminate in this year after extreme advances and prices start to decline. Bear markets usually start in September to November at the end of the 9th year and a sharp decline takes place. See 1869, 1879, 1889, 1899, 1909, 1919 and 1929, the year of the greatest advances, culminating in the fall of that year, followed by a sharp decline. Ten is a bear year. A rally often runs until March and April; then a severe decline runs to November and December, when a new cycle begins and another rally starts. See 1910, 1920, 1930. Putting all that together, we can expect US stock markets to have a year with a downward bias, for 2010,with probable lows later in the year, around October / November, then a decent rally into 2011, into the Northern Hemisphere summer, with then further (higher) lows in 2012. By then, the recent GFC will be but a distant memory and the US will be well into its next – inevitable – real estate cycle: inevitable because the underlying structure of the economy has not been altered. Indeed, the current President has done all he can to preserve it, laying the basis for the non interruption of these cycles and patterns. 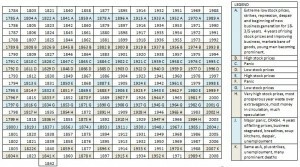 Gann’s Financial Timetable is a fraction out now, as originally published by Gann, but, for reasons I will not go into here, if you replace ‘1989’, with 1991, and count forward, this will give you something VERY interesting to follow over coming years. You can use the full capabilities of Optuma to test out all the Astro analysis tools for 14 days free. During your trial you will have access to a 30 minute consultation with a trained Optuma expert, assisting you in getting the most out of your trial.